Our water pump systems run both during the day, and at night. Designed to run for years without any maintenance, these highly efficient systems can be installed on a new well or an already existing well. The system is delivered with its own portable building, already tested and ready to connect to the pump. The well and pump are not included. 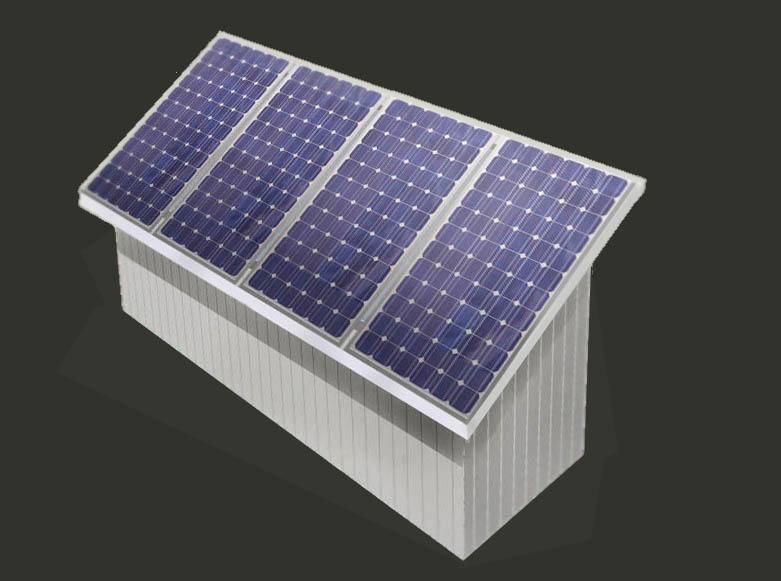 Energy from the solar panels charges the batteries, which in turn power the inverter and pump. The solar system automatically charges the batteries during the day. When batteries are fully charged, the solar system will turn off until batteries need charging again. Fully charged batteries will power the pump for a fixed amount of time, regardless of when the power is used. Currently, we have 2 types of systems available, each type with several different models. This system is an entirely independent and off-grid setup. It uses the solar panels to charge batteries, which in turn power an inverter and the pump. The normal running time on the pump is 1 hour/day, delivering about 600 gallons of water per day. Depending on the number of solar panels and batteries, models with different running times are also available. This system automatically switches to solar power when the grid fails, then back to the grid when power is restored. Running times depend on the number of panels and batteries installed. Building Size: 4 ft x 10 ft x 6 ft.
Building Size: 6 ft x 20 ft x 6 ft.
Load Up to ¾ hp submersed water pump using up to 2,500 Watts continuous, 6,500 Watt surge, 220 V AC and 20 to 50 psi pressurized tank. Inverter 4,000 Watt continuous, 7,000 Watt surge capacity. 24 V DC input, 220 V AC output. Solar System 4 to 12 x 12 V DC diesel tractor batteries with at least 700 Ampere start current. Charger Controller Located inside the portable structure, charger controller houses, a controller, circuit breakers, terminal strips, microprocessor assembly, and 2 position switch battery switch. Connection Box Port for connecting 220 V AC from the inverter to the pump. Wiring The wire sizes depend on the current being carried. Sizes up to 03 gauge are used. Wiring is fully connected to each component and tested before shipment. System The Well Power Systems are delivered assembled in portable structures, ready for connection to an existing well. Transfer Built-in automatic transfer switch from grid to battery power and back. Connection Box Port for connecting 220 V AC from the inverter to the pump and from the grid to transfer switch. 1 portable building on skids, each with roof-mounted solar panels, weighing between 700 and 2,500 lbs. plus one pallet for 6 to 12 batteries. Equipment: 5 to 8 weeks after receipt of purchase order. Installation Assistance and Alignment: According to Schedule, up to 6 months after equipment delivery. Warranty One year limited warranty on defective parts returned to manufacturer.